This is a classic model of the Alfa Romeo 155 V6 TI. The car made its debut in the 1993 season of the German Touring Car Championship (DTM) series, blowing the competition away in route to becoming that season’s champion. While the works team used the newest 1994 spec of the car in the next year’s DTM, the 1993 version was used by a number of private teams including the Schübel Engineering team. The Schübel car was adorned with the orange livery of the German liquor company called Jägermeister, and it got its German sponsor some podium time by finishing third in the final round of the season. 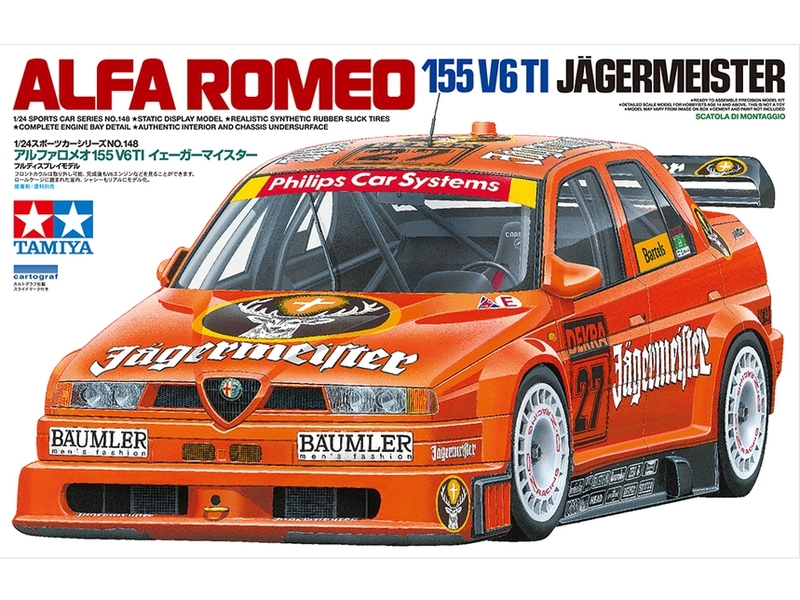 •	Features a highly accurate recreation of the body of the 155 V6 TI. •	The V6 engine is recreated in impressive detail, with separate parts depicting air funnels and intake. •	The underside of the car features realistic depictions of suspension and exhaust system. •	Interior features roll cage, bucket seat and instrumentation captured in detail. •	Realistic synthetic rubber tires. 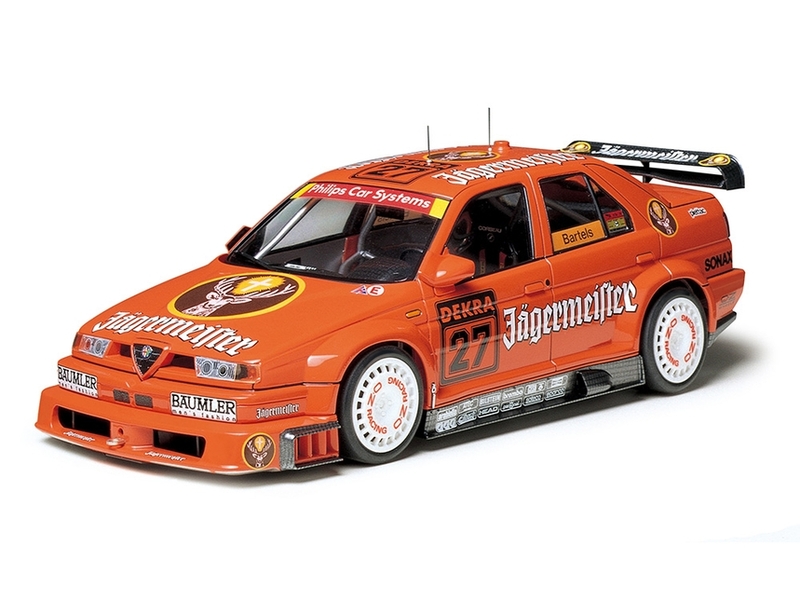 •	Markings are included to recreate the distinctive Jägermeister-sponsored No.27 car. Special Feature 1 Features a highly accurate recreation of the body of the 155 V6 TI. Special Feature 2 The V6 engine is recreated in impressive detail, with separate parts depicting air funnels and intake. Special Feature 3 The underside of the car features realistic depictions of suspension and exhaust system. Special Feature 4 Interior features roll cage, bucket seat and instrumentation captured in detail. Special Feature 5 Realistic synthetic rubber tires. Special Feature 6 Markings are included to recreate the distinctive Jgermeister-sponsored No.27 car.